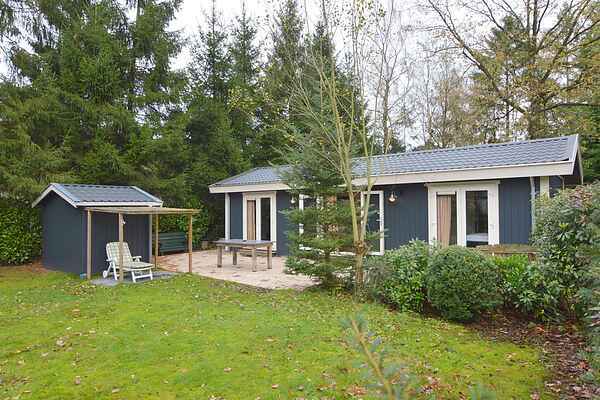 This very tastefully furnished holiday chalet is located on a small-scale holiday park at the edge of the Veluwe. The chalet is very luxurious, the living room is equipped with air conditioning and features a high ceiling and large windows, creating a spacious feeling. The chalet features a well-equipped kitchen and a high-quality bathroom with shower, washing machine and dryer. The toilet is separate from the bathroom. Outside, you'll have a spacious, enclosed garden at your disposal. The chalet also has a parking space and there's a shed to safely store your bicycles. The park has a number of facilities such as bike rental, boules court and children's swimming pool (open depending on the weather and the demand). From the house you can walk straight into the forest. The Veluwe is a magnificent area to walk and cycle. It is possible to take a hike with the forester. There is so much to explore in the direct vicinity. You can visit several different attractions: the Apenheul, the Dolfinarium, Koningin Juliana Toren, Walibi World and for culture lovers a visit to Het Loo Palace in Apeldoorn. Fancy a day of relaxing? You can do so at the wellness resort the Veluwse Bron.